The passion to learn contributes to the human being development. Education is an important pillar of our society, in term of social, economical and cultural development. Education is the basic tool allowing everybody to be first a human being, to develop himself, to have a job and to be integrated in a society where he can share, communicate with other people. But a statement needs to be done: everybody is not equal in term of education, and some people are not succeeding very well in their studies. The chance for these people to be integrated in the society and to live in harmony is lower. There are many reasons why some people does not succeed in their studies, in their life. There is a first reason which is a social reason. Children who are living in a family where the parents have a low education level, will face more difficulties to acquire a higher education level than their parents. But it does not mean necessarily that they cannot succeed in their education. There is probably a question of temper. The ones will show more will and perseverance to succeed, the others will be quickly discouraged. Here is the need to have a performant education system, where teachers can play an important social role, contributing to help everybody to meet success in the education. Let us have a look on the needed ingredients to build a strong educational system. A first condition is to have passionated teachers. As in many jobs, the passion is a key factor of success. The passion brings the motivation to increase your skills and capabilities in areas of interests, and leads you to give the best of what you can do. The passion is something you can transmit, you convince the other because you are convinced yourself. In education matter, passion is something you have to transmit. Some teachers show lack of passion, which is not an example to motivate children or students. The learning process needs efforts, where we have to cross over difficulties, and students have to be motivated to cross over difficulties, to face challenges. Challenges are what we have to face during all our life, and what make us more self-confident. Education has also to prepare the children to face this. Another important condition to motivate students and to bring them to success in their educational process, are the educational skills of teachers. It is important to be able to explain things on different ways with examples. Some teachers are able to explain complex matters by making comparisons with simple concepts, with concrete things, allowing the students to visualize more easily the teached matters, the explained concepts. But it is also important to explain what is the utility to study matters. What I am saying here, is not that there are useful and useless things to learn. It is not a fact but a wrong perception the children have, and they are wondering why they have to learn things which seem to be useless. They are judging it as useless, because they don’t perceive the goal of learning it. I will take the example of mathematics. I remember teachers explaining theorems, formulas, hypotheses, and logical developments. But at that time, I had the feeling that the only goal to learn these things was to get enough points at the end of the year, to succeed in the examinations, and to have a qualification. I had the chance to have later a professor in the university who was illustrating mathematical concepts or equations with concrete examples. It was much more easy to understand theoretical concepts with practical examples. Knowledge is the raw material of intellectual and social development. All what we are learning at school, in mathematical, physical, chemical sciences, literature or history, are the basic components to understand or to build more complex concepts or knowledge. But it is also important to show the brought added value of the combination of skills, of disciplines. We can see today new jobs which were not existing some years ago, but which are only a combination of existing jobs and skills. Let us take the example of somebody who is a qualified translator and who has passions of IT and can make programs. By combining two skills sets, he can create translation programs or to work in the online translation industry. The added value of such combination will be a motivation to learn and to develop other skills. For instance, in our globalized world, a stylist who want to present creations in foreign countries like Italy or United Kingdom, could be find more motivation to learn languages, because she has a concrete reason, a concrete motivation to learn it. As I mention before, education goal is first to become a human being, to build our personal development, to become first the actor of our own life. The role of the education system is also to help children to develop interest areas and to help him to build their own life. The development of interest and curiosity will contribute to develop motivation, and drive people to passion. Passion is an essential component of self-development. Passion leads people to move their limits forward, to encourage them to face new challenges. Passion is also something teachers have to transmit. And to transmit passion, I am coming back to the first point I presented here, to have passionate teachers communicating the passion to learn.As in many areas, passion is a key factor, and the passion to learn can lead you to unlimited new horizons. Let us give the key of passion to learn to the new generations, giving them the opportunities to conquer their freedom. A technological symbol for a better future. 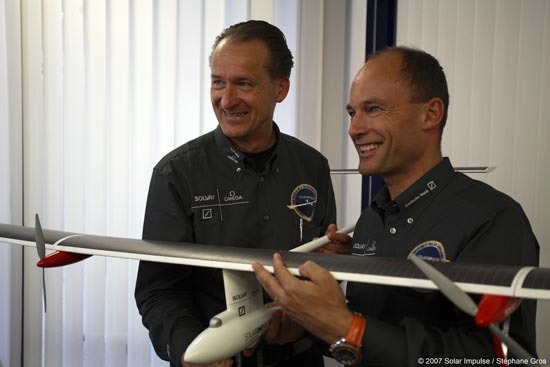 Bertrand Piccard and André Borschberg, the two founders of the Solar Impulse project. On Friday may 13th 2011, the experimental solar energy airplane, Solar Impulse, was starting his first transnational travel, taking off from Payerne in Switzerland, and landing on the Brussels Airport, 13 hours later. Solar Impulse, is the result of a project initiated by Bertrand Piccard, doctor and aeronaut. “The goal of such experimental project is to encourage political decision makers to adopt more ambitious policies in energy matters.” said Bertrand Picard. He pleaded for a change of mind in order to encourage people to use green and renewable energies, and to stop to waste fossil energies. 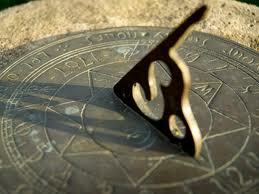 This nice technological project is in my mind a symbol for different reasons. This solar airplane is an evidence that we can always move the limit forward, and here more specifically the limits of research and development. During this first transnational flight between Switzerland and Belgium, the pilot, André Borschberg, the pilot and CEO of the project, mentioned that the solar cells of the airplane captured more energy than the airplane needed during this travel. This is probably the first time that a transportation mode is acquiring or “producing” more energy than he uses. It is a revolutionary invention, giving opportunities to other project developments. This project contributes to build a better world on the ecological level. By using renewable energies, this technology contributes to preserve the natural resources. As we know, natural resources capacities are not unlimited, and we are using more resources than the world is producing. By using renewable or green energies like solar and wind energies, we contribute to preserve our environment, to reduce pollution and preserve ecosystems. These renewable energies can have a positive impact on the economy. The usage of fossil energies will become more and more expensive as the costs of extractions are increasing. The cost increase of fossil energies has a negative impact on the margins of the companies. The usage of renewable energies could have a positive impact on the profitability of the companies, and could ensure the sustainability of their activity by decreasing their dependency to the fossil energies. The human begin is able to do the best. This solar energy airplane is the result of efforts, of people working together on a project contributing positively to the development of the usage of renewable energies. This project is the result of a wonderful team work, where each people dedicated efforts to contribute to the success of such beautiful project, initiated by Bertrand Picard. I remember when Solar Impulse did his first experimental flight, Bertrand Piccard was crying because he was so happy to see the concretization of his dream, and we could imagine that this day was so rewarding for him but also for all the team working on this project. This project is a nice example of entrepreneurship. This project concretization is a wonderful incentive to promote entrepreneurship. It shows that dreams can be transformed into reality, and that by joining competences within a team and with hard work, it is always or very often possible to reach objectives. And if such project does not succeed on the first trial, we can always learn from the different steps we cross over. Each experience provides a useful feedback. Take the time to save time. Remember that time lost cannot be regained. You probably have to meet such situation where people are running after the train, in order to meet a deadline. Running after the train because they are working following a reacting mode instead of proactive mode. Often, they are taking shortcut and postponing some tasks or duties because they have no time, because they are running to meet the deadline. But the postponed task will have to be done one of these days, and the train they are trying to take will finally crash into the wall. Why people are facing such situation? Why can they not reach the goal on time without having to speed and to take shortcuts? There are mainly two reasons to that. The first one is a lack of organization and lack of planning. One of the keys of time management is to plan tasks and to make the distinction between what is important and what is urgent. Most of the time, there is confusion between emergency and importance. You can have important things to do which are not urgent and urgent things to do which are not important. When important things have to be done urgently, it is probably because you did not plan them correctly. As consequence, you will not probably meet the deadline. Another reason of missing the deadline is an inefficient way to work by lack of efficient tools. By building some tools, spreadsheet of databases, you can automate some tasks or processes and you will gain a lot of time by getting information or results on a faster way. But of course, you have first to build these tools. It means that you have first to invest time to build these tools, but you will spare a lot of time after. It implies to determine exactly the needs and purposes of these tools, but also to have a long-term view. By determining this and by implementing the appropriated solutions, you will have a double return on investment. You will gain more time than the invested time in the solution implementation, and you will have a gain of quality level. You will be able to gain time on processing tasks and dedicated to other more added value tasks. Planning and appropriate tools are two key components of an efficient work. It is just a question to take the time of implementation in order to save time after. Remember that time lost cannot be regained. When I started my career beginning of the 90’s, it was still believable to do your career or a big part of it in the same company. At that time, as my second job of my career, I was joining the Belgian subsidiary of a IT Japanese company with that thought. But around two years and half later, the company was restructuring and I was part of the people who lost their job. I was not really happy at that time and the future looked a bit dark in my eyes. The reason of such darkness was also that I saw people around me, people of the generation of my parents, working since many years in the same company and loosing their job in a few minutes. To my eyes, something was changing. The world of business and of jobs will not be the same than before. When such things happen, it is always an opportunity to analyse your background and to understand the way you did. I remember that I had my second job because there was some knowledge and experiences needed, and that I had the chance to develop this knowledge in my previous job. The experience I acquired during my first job was clearly an asset to build my career, to get other opportunities. I compared also my first job and the second one to see what was different. As first job, it is always the one where you will learn a lot because it is your first experience, but in my case, another reason was that the small structure of the company where I was working, was an environment where you have to do a range of different tasks and where you can learn a lot of different things. My second job was an interesting one, but was only focused on a specific function. I was account receivable accountant at that time. By having a look to the two years in these Japanese company, I had to note that my career and work evolution was lower than in my previous job. By thinking about this particular change in the work world, I conclude that before, the perspective to work on a long-term basis for the same company was seen as a positive and comfortable perspective, but this statement is not true anymore today. You can maybe still work for a long time in the same company, but the most important is to make sure that you will evolve in different functions, that you will expand your skills and knowledge. The comfort is something enjoyable when things are going well in your job. But the question is how long will it stay like this. In a fast moving environment where restructuring processes happen more and more in companies, the comfort feeling could be a danger. Skills, capabilities and experience are the guarantee to succeed in finding of job opportunities. But skills and capabilities are not something static, but dynamic. In a fast moving environment, your skills and competences have to move, to evolve too. As I mentioned before, you will probably have a job because the needed competences match with yours, but you have also to stay competitive on the job market place. It is the reason why the acquisition of new competences and the talent development is an asset and a necessity. It is important to check time-to-time, in your professional as in your personal life where you are, where you were and where you want and have to go. When you see that things do not change a lot and that you are still in the same place, in the same function, that you do not see any evolution in your work, your career, than think that it is probably time to move to another challenge. Think also to follow some trainings in order to improve and increase your knowledge in specific areas, in some matters you are interested by and where you have really talent. Don’t do this only in your professional life, but also in your personal life, by having hobbies, fixing a goal to them and persevering in order to reach your goal. 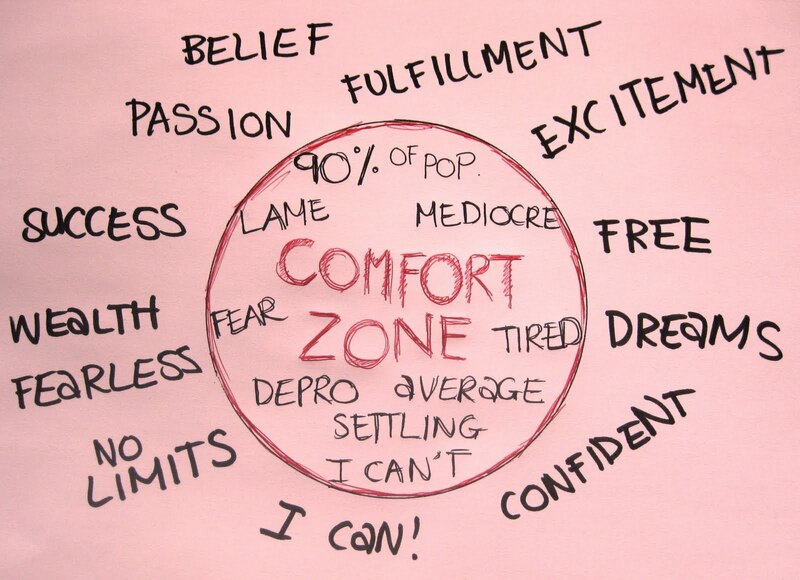 In other words, move from the comfort zone to the discomfort zone. Move to the discomfort zone has to be an ongoing process. As many exercise, we have to be used to do it, we have to go over a certain inertia. At the beginning of my career, I was thinking to do my career in the same company. Today, as freelance consultant since few years, I cannot imagine anymore to move to such career if it would be possible. This statement, this experience makes me take a few conclusions. In every negative event, you can always learn something and find opportunities. It is a characteristic of an entrepreneur mind, and you have to be the entrepreneur of your own life. Move to the discomfort zone will give you other opportunity, will contribute to your self-development and empower your self- confidence. Move to your discomfort zone is just a question of habit. With this, you will see that the discomfort zone is not so uncomfortable.